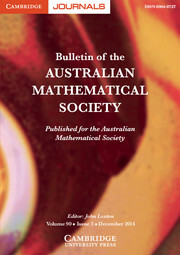 The BULLETIN of the Australian Mathematical Society began publication in 1969. Normally two volumes of three numbers are published annually. Since 2008 the journal has been published by Cambridge University Press.